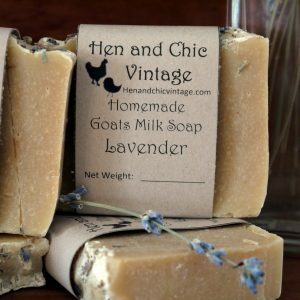 We are jumping back into Hen and Chic Vintage head first and opening up not only vintage items but homemade soaps, lip balms, and other organic beauty products. For the last couple years, I have spent my time being a full-time antiques appraiser with a local firm. This time away has allowed me to grow my skills in both antiques and in business. I have had a lot of fun, challenging, and educational experiences to say the least. 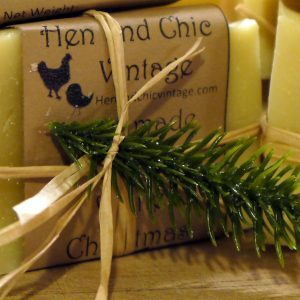 When I originally started Hen and Chic Vintage, I was not ready to go at it full-time. I didn’t have the energy or the confidence to run my own business. Now after spending a little time away, I realize that this is my passion, working with antiques, creating things with my hands, and educating others. I left my full-time job in December in order to focus on bringing Hen and Chic Vintage to prime time. I have been working with antiques for the past 10 years and this will always be my passion, but I have always loves making things with my hands. 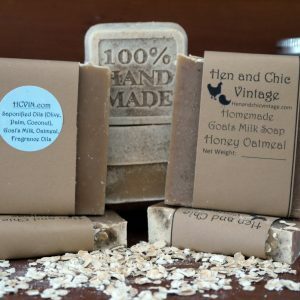 So, this time we are not only selling vintage goods but now I am making my very own organic homemade soaps and beauty products. It has always been a goal of mine to make traditional homemade soaps, who knew I could actually be good at it. Over the past couple years, I have been crafting soaps on my own just as a hobby. 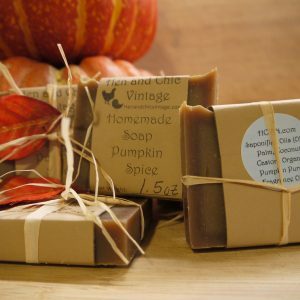 Late last year, I gave some of my soaps away for the holidays and gifts. Well after several people came back for more and a friend even said she wanted 40 products for party favors, I thought I might have something here. I was a little reluctant at first, but I knew that I had to follow my passion even if it was going to be difficult. Plus, it didn’t hurt that everyone was asking me to do it. I even had a friend ask me personally to help them decorate their home because they liked mine so much. I’m a pretty humble person and I just do what I do, not really intending on people liking it. This person just kept insisting that I needed to start the business backup because they needed stuff for their new home and they didn’t have time to dig through dusty estate sales to find cool stuff. So, here we are embarking on a journey for the second time with the confidence and know how to make this thing a success. Let me tell you a little bit about my trials and tribulations with developing a new skill, soap making. We first tried out a pure olive oil mixture and used our family and friends as guinea pigs, thanks guys. We read all the directions, put on all of our safety gear and set to work. All I kept thinking while we were measuring out our ingredients was, “please, oh please let us not die using this lye.” Needless to say I am still alive to tell the tale of our first batch of soap. It was amazing! We made soap! Lather, rinse, repeat. I can actually say that about my own soap, it lathers and it rinses off. It’s wonderful! 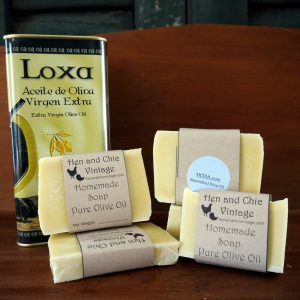 Since our pure olive oil soap we have made several other types of soap including the ever daunting goat’s milk and honey soaps. There are many issues with these two types of soap. The honey sugars heat up the soap to a very hot temperature and accelerate the trace, that’s soap speak for “it’s ready to put in the mold”. Acceleration in trace is tricky and you have to act fast and get the soap in the mold or it will get lump like bad gravy. My first batch look like a gravy science project Dr. Frankenstein made in his lab. After I “mastered” the honey in my soap I decided milk was next. The trouble with adding any type of dairy, goat’s or cow’s milk is it can scorch or burn. First, thing’s first you have to freeze your milk into cubes before you start anything. Once you have frozen your milk you are almost ready to start making soap. Because you are pouring the lye directly on top of the milk cubes you have to keep the cubes in an ice water bath and keep the temperature way down. Keep stirring, don’t let it burn. If it turns brown, it’s scorched and you have to start again. Luckily, I succeeded in not burning the goat’s milk. HURRAY!! After the oils and have reached their desired temperature and the lye milk and proceed making soap as usual. On top of making the soaps I am also making lip balms. I will tell you making the lip balms is a tad easier than making the soaps. I start off with natural coconut oil and beeswax and pure essential oils. When it comes to anything you might ingest you have to use essential oils and NOT fragrance oils. After melting the coconut oil and the beeswax add the essential oils and you are off you the races. But wait there’s more! I thought it would be a terrific trifecta if I made body butters too! I know what you must be thinking, “where does she find the energy to do all of this?” Well, I will tell you, it’s literally just in my nature. And I do it without the assistance of any caffeine. I mean you all know me as a go-getter and very hyper, right?, right? So, the body butters like the soaps and lip balms are naturally made with shea butter, coconut oil and essential and fragrance oils. The process is pretty straight forward melt all the oils, refrigerate, whip and then add the essential or fragrance oils. Once everything is whipped spoon into your designated containers and you’re ready to gift or keep them for yourself. Now we have five different scents available for purchase through our Etsy Shop, HenandChicVintage. Sweet aroma of vanilla bean. All natural beeswax and coconut oil.